The American Media speaks in apocalyptic terms about Trump, America and the World. Trump is unacceptable to them and his policies are destroying the Country if not the world. It may well be, however, that many Americans don’t agree with the Media. CNN found out just that. 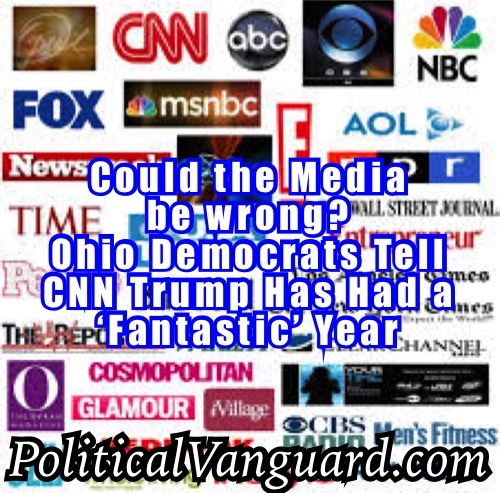 From the Washington Free Beacon we read: “A group of Ohio voters sat down with CNN’s Martin Savage in a segment that aired Wednesday, and they praised President Donald Trump’s first year in office. The panel of Democrats, who crossed over to vote Republican in 2016, faced questions about a variety of topics involving Trump and his administration. They all live in Youngstown, Ohio, but they have different occupations and backgrounds. “Fantastic,” ironworker Rick Green said. “Phenomenal,” Geno DiFabio, a machine shop worker, said. “Better than I ever would have dreamt,” one woman said. “Yes, I agree. He’s doing wonderful, he’s staying on task,” pastor Derrick Anderson said.